Audi officially launched its first electric SUV, the e-tron SUV in San Francisco. 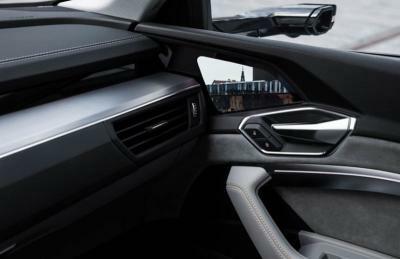 As was revealed in the concept e-tron in July, the e-tron can optionally use 7" OLED virtual side mirrors and external cameras instead of the normal mirrors. This is not a new concept, but it is great to see Audi adopt this technology in a serially produced car. In 2012 Audi equipped its R18 sports prototype with a 7.7" virtual rear mirror, and later announced it will bring such mirrors to future e-tron cars. Audi to equip the R18 e-tron car with their 7.7" AMOLED digital rear-view "mirror"